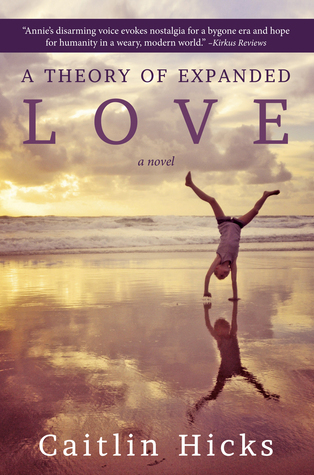 Hidden within the context of America's volatile 1963-1964, A Theory of Expanded Love by Caitlin Hicks is the sort of novel I wish came my way much more often. Annie, the protagonist and narrator is a spunky 12 year old Catholic girl in 1960's California surviving her gigantic family of 13 kids, tired mother and military father. I think of Annie as a sort of American Anne of Green Gables mixed with The Catcher in the Rye, if Anne weren't a windswept orphan in PEI. Annie is spunky, doubtful, vigorous, hard working and alive. She is quintessential 'growing up' and her quest is both full of mundane and life-altering importance. Her family is vivid, overwhelming & intense. I wanted to re-read it the minute after putting it and my bookmark down. I can't find a single fault in this novel. It took me through the horror of forced adoption, misogyny and into the exhilaration of hitchhiking, kittens and the realizations of growing up. I had to lock this book in my car, to stop from reading it at my work desk. Caitlin Hicks is a true and undoubted treasure, both as a performer and as an author. She brought this coming-of-age tale to true and vibrant life. I struggled and rejoiced with Annie, Madkap and Clara. I hated John-the-Blimp and the strict hypocrisy of 1960's catholic misogyny and the Shea family patriarch. Every woman should read this book to feel that shared connection of the feminine experience, and every man should read this book to remind them of how far we've come and still need to go. Fantastic, Caitlin.